Looks like we’re getting more and more submitted photos every day but please be patient as we’re going through the process of uploading all of them. – Any submitted photos or videos with no captions will be displayed but WILL NOT be considered for the contest(s). In other words, caption is mandatory. One might wonder though “what’s an appropriate caption?“. Well it could be as simple as just the location, however everybody would appreciate to know more, so even a short blurb and a date would be welcome. 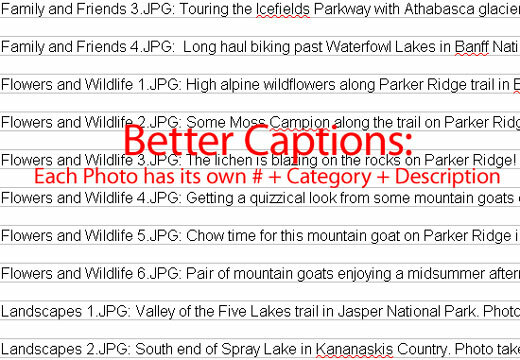 Some of you forgot to submit their captions when sending us their photos, it’s not too late to do so but make sure you clearly identify your shots and do so before February 2013! Get a look at what we would expect when you submit your photos/videos. – Make sure each submission is clearly identified when you submit your descriptions file. As well we need to know the category you’re competing for. Once you submit for a category, your submission will compete in this category not all of them. Submitting a caption is as easy as submitting a photo. At the bottom of this page you can send us your text as a Word document, a text file, a PDF, in the same way you attached/sent us your shot(s). Let’s say I’ve got 20 photos I want to submit. I would select “Choose File” for each of the 10 photos, the last “Choose File” would be a text file with references and captions for all the 10 photos. – If you enter your best landscape shot with the proper caption, you’ll have a chance to win a Dream Getaway to Jasper, Your best wildlife or flower shot will give you an opportunity to compete for a Dream Getaway to Banff, and your best family/friend shot might be selected and win a Dream Getaway to Revelstoke. Lastly the best video will be awarded a Houseboat Vacation!! 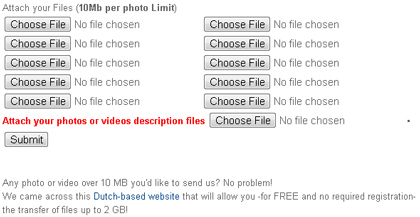 – There are no limits: you can enter as many shots as you wish and in all categories, same goes with the videos! – The 2012/2013 contest will be over by the end of February 2013, so you have plenty of time, and we expect to receive winter shots as well. – Pictures/videos should (preferably) be shot in any provincial or national parks in Alberta, British Columbia (or in Montana). We say “preferably” because you might have an incredible shot of a bear outside a park, or you might have a nice landscape photo that’s not in the mountains. Send it to us! We’d like to be surprised.